Each Grade Level has specific Common Core Standards for Math and English Language Arts that students must learn throughout the school year. In other words, the Common Core is basically, “What your students should learn by the end of the school year.” Our workbooks focus on this by covering each standard with at least one center activity, a couple worksheets, and a poster. The result is a 500-900 page workbook that covers all appropriate grade level materials. 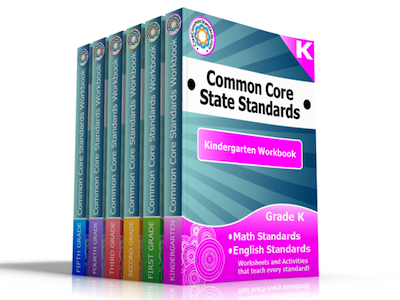 Use these links to learn more about your child’s Grade Level Common Core Standards in Math and English: Kindergarten Sample, First Grade Sample, Second Grade Sample, Third Grade Sample, Fourth Grade Sample, Fifth Grade Sample.